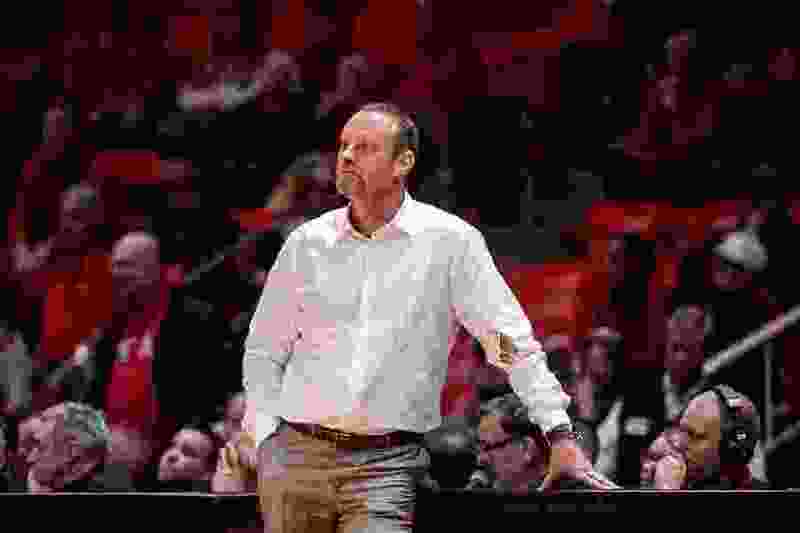 (Trent Nelson | The Salt Lake Tribune) Utah coach Larry Krystkowiak as the University of Utah hosts USC, NCAA basketball at the Huntsman Center in Salt Lake City, Saturday Feb. 24, 2018. Like a launched spinning deep 3, a question that rises up every year at this juncture rotates and rises again: What is to be made of Larry Krystkowiak’s Utes this time around? And like most years for the past seven, nobody knows the answer with much certainty until the ball splashes the net or rattles around the rim and drops or falls away. Krystkowiak has made guessing what Utah basketball will do, what it will be, a difficult proposition. It frequently is undersold in the preseason, thought less of than it actually should be. And nearly as frequently, Krystkowiak finds a way to surprise those who do the projecting. Not always, but often. This season, for instance, the Utes are picked to finish eighth in the Pac-12. They’ll do better than that. Last season, they were picked to finish seventh, and instead climbed to the third spot, finishing with a 23-12 record. On the other hand, surprising is not the aim of a basketball tradition as accomplished as Utah’s. That aim would be … consistent winning. Qualifying for the NCAA Tournament is always the intent, if not the absolute expectation. Nobody around here takes much satisfaction in making the JV tournament, even after last season’s trot to the NIT championship game in Madison Square Garden. That was good for who it was for and all, beating UC Davis, LSU, Saint Mary’s and Western Kentucky, before losing to Penn State. But it brought only an empty kind of fulfillment. It was as much an indictment of earlier failings as it was a celebration of present achievement. Either way, that outcome was preferable to the previous March, when the Utes lost to Boise State in the NIT’s opening round at the Huntsman Center. If you remember, prior to that, Utah lost in the second round of the NCAAs to Gonzaga, it lost to Duke after making the Sweet 16, it lost to Saint Mary’s in the first round of the NIT, and before that were … well, the dark, unmentionable years. Since Krystkowiak was hired prior to the 2011 season, his teams have finished 11th, 10th, eighth, third, second, fourth, and third in the Pac-12. How you evaluate that overall performance, how much satisfaction you take from it, depends on your frame of reference for what Utah basketball should be. Should it conquer the Pac-12 or should it be content with hanging somewhere within shouting distance of a league title, always falling short? What’s realistic? What’s unreal? As those standings indicate, Krystkowiak hauled the Utes out of the dumps upon his arrival, bringing them back to respectability. Getting to the Sweet 16 was the pinnacle of his tenure here, along with developing three players — Delon Wright, Jakob Poeltl and Kyle Kuzma — enough for them to be selected in the first round of the NBA Draft in three consecutive years. That draft succession hadn’t been seen at Utah since the competitive glory years, when Keith Van Horn, Michael Doleac and Andre Miller were first-round picks from 1997 to 1999, sandwiching the Utes run to the NCAA championship game in 1998. This year’s team has many new additions — there are eight freshmen on the roster — mixed with a few familiar names, such as seniors Sedrick Barefield and Parker Van Dyke. Another senior, Novak Topalovic, is a graduate transfer from Idaho State. Notable it is that all of those freshmen were born after the aforementioned national title game appearance. And speaking of names to get accustomed to, the Utes have some doozies on their roster — newcomer Topalovic, sophomore Christian Popoola, freshman Both Gach, freshman Vante Hendrix, and freshman Lahat Thioune. Also, the diversity on this Utes iteration is kind of cool. Among the players listed on Utah’s website, six are from California, one from Oregon, one from Michigan, three from Utah, one from Minnesota, one from Senegal, one from Serbia, one from Nevada, one from Colorado, one from Idaho, one from Arizona. If there were a player from Antarctica who could D up, go left, and trigger the break, Krystkowiak would seek him out. In the only early evidence of who might contribute what, in the Utes’ exhibition win the other night over College of Idaho, freshman Timmy Allen scored 18 points, grabbed seven rebounds and passed out four assists. The veteran Barefield had 10 points. Gach and sophomore Donnie Tillman had 12 points each. And Topalovic got 11 points and 11 boards. One thing is certain with this group: It is more athletic than the Utes were a season ago. But to make Utah’s attack click, the ball will have to be shared and defense will need to spark early offense down the floor. If the former steadily combines with the latter, Krystkowiak’s Utes once more will make prognosticators think and rethink their preseason picks next time around. Whether it satisfies the aim of a proud basketball tradition — that ball spinning in the air — is a different matter.